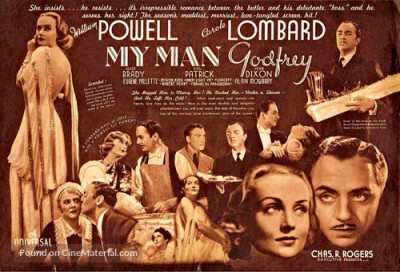 One of the seminal Hollywood screwball comedies, My Man Godfrey (1936) has survived decades of presumed public domain status and, resultingly, extremely poor and cut home video versions. Criterion's new Blu-ray, licensed from Universal, fixes all that, offering a scintillating new HD transfer. Directed by Gregory La Cava, the film holds up well for the most part as a scathing satire of the Idle Rich during the Great Depression, though its faith that their humanity can be so effortlessly be redeemed now seems painfully na�ve. Irene, feeling guilty, offers Godfrey a job as her family's butler. Amused by this, Godfrey accepts. The Bullock's Manhattan home is as stately and vacuous as its inhabitants. Matriarch Angelica (Alice Brady) is flighty by day and boozy by night, keeping a flamboyant "prot�g�," Carlo (Mischa Auer) around; Cornelia is patrician and condescending toward Godfrey, loving and hating him at once. Irene falls madly in love with Godfrey but he keeps a professional distance. Only the longtime cynical maid, Molly (Jean Dixon, very good), who also loves Godfrey; and Alexander Bullock (Eugene Pallette), the sardonic, personally and professionally beleaguered father, have any sense at all. Midway through, the appearance of millionaire Tommy Gray (Alan Mowbray) turns the story on its head, with Godfrey not exactly the person he claims to be. For years even Godfrey's fans have been critical of its d�nouement, the idea that the shantytown under the bridge could be transformed into "The Dump," a swanky nightclub providing employment for its formerly homeless residents. Dramas like Wellman's Heroes for Sale and Wild Boys of the Road (both 1933) and the little-seen but fascinating Beggars in Ermine (1934), to name three examples, explored homelessness and poverty more seriously, so it's not like My Man Godfrey exists in a vacuum, but that ending is in its own way as insulting as Irene and Cornelia casually treating a homeless man like a slave being readied for auction.